Cooper Union was not my back-up plan. As a five year-old, I sat in a darkened theatre one evening, pointed to the catwalks above and declared ‘I want to do that when I grow up!’ Of course, I had no idea what ‘that’ was back then. By the time I was contemplating where to attend university, I was beginning to understand that directing and designing opera was going to be my future. There are no undergraduate programs that link these two disciplines together, but as soon as I came across the unique mix possible through the BSE course of study, I knew I had found my path. In many aspects, producing an opera really feels like a natural synthesis of Cooper Union’s motto of advancing science and art. Theatre and opera in particular require a great deal of craft—I learned, and continue to learn, that aspect of the industry through hands-on experience working alongside others in the field. Further experiences have been supported by a year-long Fulbright Fellowship to complete the Corso di Specializzazione per Scenografi Realizzatori at Teatro alla Scala in Milan, which led to more work experience, assisting on productions with such theatres as Teatro di San Carlo in Naples, Teatro la Fenice in Venice, Teatro alla Scala in Milan as well as in Germany, and throughout the USA. But knowing how to express your ideas and vision is useless if you don’t have anything to say. The BSE coursework allowed me to explore topics as eclectic as my own developing interests. Two semesters of Islamic Architectural History opened my mind not only to a new visual vocabulary, but an understanding of how various spaces both secular and sacred affect the way people move, think and interact within them and with those around them. A sculpture course in which it took four months to design a single chair with discussions and critiques every week prepared me for a career in which I confidently designed a dozen pieces of furniture in the past month. I’m fortunate to work with amazing craftspeople around the world who can seemingly build anything I can imagine, but at the core of every stroke of my pencil (or mouse) lie the questions of who? and why? and where? and how long?. Before Cooper Union, I likely would have thought that the task would have been to merely decide on the materials and the dimensions of an object to sit on. Today, one of the key reasons I often design my own scenery in the productions I direct is because I see an indestructible link between an object and how it is used that is rooted in the curriculum at Cooper. I also collaborate with other designers who bring fresh perspectives from time to time. On the engineering side of things, I can honestly say that I’ve never used any concepts of differential equations or vector calculus in my work nor am I responsible for how large sets get built, rigged and automated, but learning to speak a technical language has smoothed my interface with the teams of people that are charged with managing thousands of pounds of scenery. Seminars on business management and intellectual property rights provided firm footing for dealing with dozens of employers in various countries around the world. And the sheer discipline of just getting through some of the rigorous foundation courses made my learning to speak German and Italian, for example, seem a lot easier by comparison! 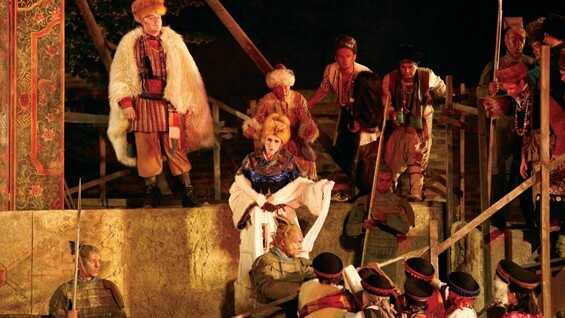 One project in particular this season that stands out is a production of Puccini’s Turandot that I created together with Madeleine Boyd, a designer based in London where I now live, for the Augsburger Freilichtbühne in Bavaria. A massive amphitheatre that is built into the medieval ramparts of the ancient Roman city provided an atmospheric venue, but also the challenge of meeting the scale and permanence of a structure that has stood steadfast for nearly five centuries. Instead of confronting the architecture itself, we took an archaeological look at the narrative. By literally unearthing the story, we found the poetic possibilities liberated from the aesthetic realities of the Chinese imperial setting. I direct four or five new productions in any given year, and though none of them individually can be considered emblematic of my style, taken collectively a certain approach can be seen. With the life-cycle from commission to premiere averaging about a year and half, there are always several new productions on the table at the same time, so certainly cross pollination occurs and there are always ideas that don’t get fully explored in one production that end up finding a more distinct voice in another. More images and information on upcoming productions can be found at www.tstrassberger.com.